Mark LaPlante’s Story - Fairlawn Brought Me Back - 28 years & thousands of comeback stories. Tell Us Yours! In the frigid blackness of night, Mark LaPlante called out for help. But his voice, his only hope for survival as he lay motionless in the woods of Skowhegan, Maine, could not be heard above the grating roar of passing snowmobiles. Just moments earlier, Mark had been riding his own snowmobile when it hit an ice patch hidden below the latest dusting of snow. Skidding off the trail, he and his 800 pound sled sailed over a 20-foot cliff, landing in four feet of snow. Losing his helmet and right glove in the fall, Mark’s body, with two broken femurs, a shattered right arm and sprained left wrist, remained quietly still in the minus-35 degree temperature. After numerous attempts to get the attention of riders speeding across the paths above him, he made the decision to remove his other glove so he could retrieve his cell phone from his pants pocket. Successful in the painstaking effort, Mark gingerly held the phone in his usable left hand, slowly positioning it to dial for help. But just as his numbing fingers touched the keyboard, the phone slipped from his grasp, tumbling into the snow. It would be three hours before a beam of light from atop the cliff shown down into the black space where Mark lay freezing and silent. It was one of his snowmobile buddies, all of whom had been desperately searching for their friend. At a Bangor hospital, Mark underwent six hours of surgery to fixate his broken bones. It was there he also learned that all ten of his fingers had frostbite. Four days later he was transferred to UMass Medical Center, and three days after that he was transferred to Fairlawn. But Mark’s treatment team worked around his limitations. 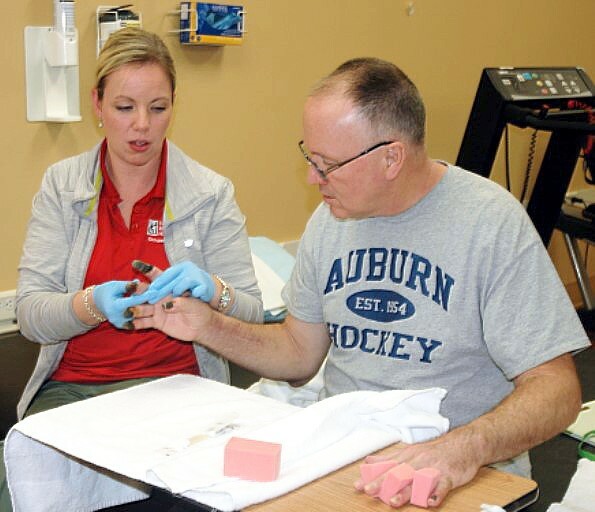 Using adaptive equipment and modified ways to do activities of daily living, his OT worked to improve his hand function — not an easy task given the severity of his injuries and pain. Mark and his occupational therapist work to increase range of motion in his forearm and frostbitten fingers. Once he could tolerate being in a wheelchair for an hour or two, Mark’s inability to bend his legs kept him from standing or walking. That, as well as the deficits in his hands and arms, precluded him from propelling the chair. Yet, with his drive and the team’s expertise, he kept moving forward. And it did not dissipate, even on discharge day. “When I came to get him, staff lined up to say goodbye,” said Denise, his long-time partner. 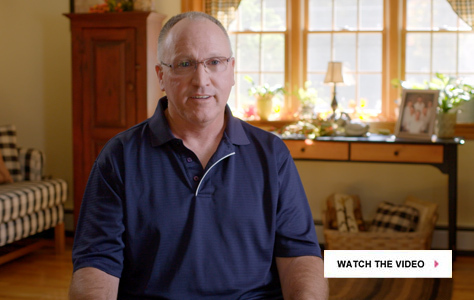 “They were crying, and so were we.” Mark continued to make strides in outpatient therapy. While a heterotopic ossification in his right quad inhibits range of motion in that leg, it greatly improved in his left leg. And although he eventually had the tips of four fingers amputated, he can now do nearly everything he did before his accident, including driving, fishing and even lacing up his ice skates. Yes, in September, Mark donned his skates and got back on the rink again for the first time since last winter. He hopes that a return to coaching hockey is right around the corner. 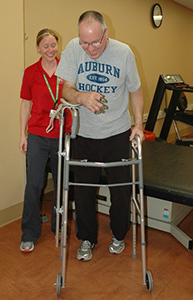 During outpatient physical therapy, the focus was on improving the strength and range of motion in Mark’s legs.